Continuing what seems to be an American Civil War theme, I’ve recently posted a report of one of our recent Friday evening Volley & Bayonet encounters. Using armies based on the Bristoe Campaign of October 1863, we deployed the figures for what was a most enjoyable game. Enjoyable from a game perspective, but equally interesting from an historical perspective. To place it in some context just outside of Fredericksburg are the battlefields of Chancellorsville, the Wilderness and Spotsylvania. The last two cover Grant’s 1864 Overland Campaign – where Meade commanded much of the Union army. Unlike the Campaigns of 1862 here Grant, despite being fought to a standstill, just wouldn’t break off. Instead the Union army slipped east, eventually ending around Petersburg. For me this most recent fictional battle reminded me of the impacts of the terrain and the resolve the commanders had to damage the enemy army. In our game our “Wilderness”, despite being much smaller and of course meaning the field was considerably more open, had a similar impact. Further, like the actual battles at the Wilderness and Spotsylvania, casualties were horrific. You will find a summary of Hamstrung at Hazel Run, our fictional game, in my Volley & Bayonet section. For those interested in a summary of my visit to the Wilderness Battlefield posted a couple of years back, it can be found here. This week I’ve been reminiscing a little on my trip in September 2015 to several American Civil War battlefields on east coast. Some readers may even recall a series of articles I compiled back then as I travelled from one battlefield to another. My aim was not to post an in-depth record, but rather my thoughts each evening, as I contemplated the day. Given I was visiting battlefields each day even a small delay would mean I would get behind. As a result several battlefields failed to gain a mention at the time. One of those battlefields that failed to be recorded at the time was Fredericksburg. Fredericksburg holds a fascination for me. In part due to Burnside’s promotion after Antietam and part due to the complexity of the problems associated with such a crossing. Yet despite this I haven’t recreated the battle on the table top, though it continually beckons. Prior to my visit it had been suggested by a couple of people that there was little to see at Fredericksburg as the field had been built over. To a point they were correct, but from another perspective I feel they were wrong. Indeed, I wish I had allowed more time at Fredericksburg. My first stop when visiting National Battlefield Park sites is the visitor centres, in part due to a small fee at a number but in edition to collect a copy of the excellent park maps. These maps provide a few key points in what is typically a driving tour and tend from these points it is often worth striking out on foot. In the case of Fredericksburg I had earlier visited the other park office at Chancellorsville – four battlefields are administered by the same area and map. However, with another park office next to the Sunken Road another visit was called for. I’m so pleased I did. While waiting to ask a question I was rewarded with a very informative explanation of the gentle slope from the Marye’s Heights and the Sunken Road to historic Fredericksburg being delivered to two visiting Americans. The park officer in question was explained how to view the streets leading up towards the Sunken Road and how, using parked cars, you could see even today the swale (or depression) which provided valuable but critical cover for the Union troops. I was impressed! Yet again the park staff are a wonderful source of information. If you are visiting Fredericksburg there are a couple of things you really must see. Of course you must spend time at the Sunken Road, and consider both the original wall and reconstructed areas. An original section of the wall is shown above and a close up view of Innis House below. From this area you can also view the swale, or depression, that provided critical cover. 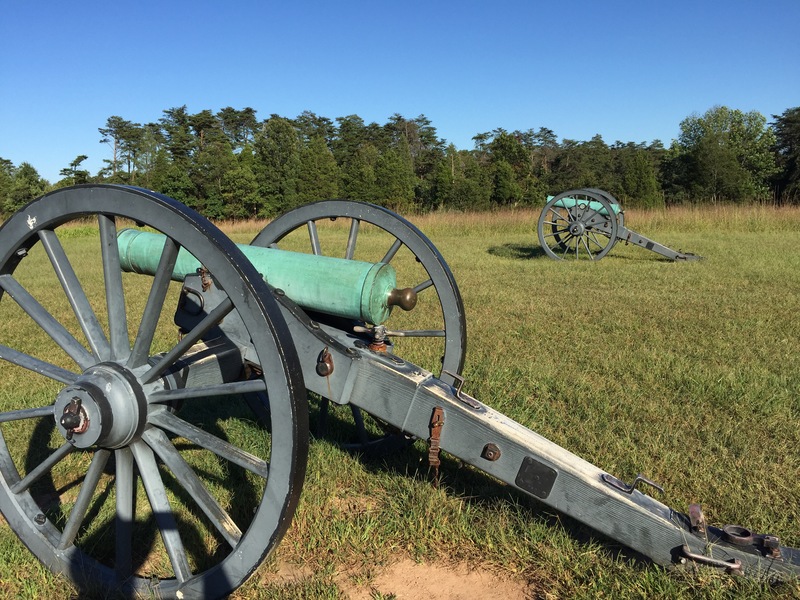 While in the area take the short stroll to the nearby Confederate artillery positions. A simple map from the park office provides guidance. After, a visit to Chatham Manor is required. Located across the Rappahannok River, on the Stafford Heights, the building provides good views of Fredericksburg and equally impressive Union siege guns deployed to provide supporting fire for the Union troops crossing the river. In December 1862 Union artillery was deployed all along the Stafford Heights, but even this section will provide a sample. While at Chatham you will also be rewarded with a visit the the manor and with a reproduction of a pontoon bridge, though reduced in scale somewhat. I understand this was built for the movie “Gods and Generals”. Below, a period view of a pontoon bridge at Fredericksburg, where General Franklin crossed. All the period photos show a very open battlefield and are ideal for gauging an understanding of how the battlefield today differs from that in 1862. Having considered the battlefield from the Union perspective I returned to the Confederate lines and traced the Rebel positions from south of Marye’s Heights, via Lee’s Drive to view Lee’s Hill, Howison Hill and south towards Prospect Hill. Unfortunately the trees provide considerable visual obstacles today for viewing the battlefield, however the artillery and slopes ensures the visitor has clarity on the difficulty faced by the Union army in December 1862. I was particularly surprised by the climb up Telegraph Hill (now called Lee’s Hill) to what was a commanding position and for much of the battle Lee’s Headquarters. Below, a 30-pdr Parrott on Lee’s Hill similar to the one that exploded here. As we continue towards the Confederate right the ground has generally less height. Eventually we arrive at Prospect Hill which effectively marks the end of the battlefield and was held by Jackson. Prospect Hill is just to the south of Meade’s attack and breakthrough. Hopefully more ground in the area of Meade’s attack, between the Confederate positions and the river, will be added to the battlefield park in the coming years. Certainly I would have valued the opportunity to explore this area in more depth. Unfortunately for me daylight was almost gone and I had to end my visit here. If you are interested in reading more on the Fredericksburg Battlefield I encourage you to visit Peter Glyer’s excellent website Mercer Square. Peter’s site provides a range of interesting and very detailed articles on the battlefield. In addition, and in something of a twist Peter was the park volunteer I encountered on my visit to Fredericksburg and who provided such valuable input for my visit. In addition I suggest you visit the Fredericksburg and Spotsylvania site Mysteries & Conundrums. A couple of weeks ago four of us gathered for another Volley & Bayonet encounter. Given we have played a few Napoleonic games of late we decided on an American Civil War encounter set in 1862. The Union forces were commanded by Jon and Alastair, with Jon proving the Union forces. Opposing them were Robin and I with the Rebels from my collection. Each army comprised 3000 points with the Rebels fielding two corps and the Union three smaller corps. While I follow the draft lists I tend to construct the divisions on actual orders of battle. For this battle the Rebel order of battle followed closely that of Lee’s army at Second Manassas in August 1862, which therefore defined the strategic situation of a Confederate advance north against Pope while McClellan removed his army from the Peninsula. Using the Scenario System in the Volley & Bayonet rules the Rebels were found to be concentrated and therefore had the burden of attack. In contrast the Union forces were strung out in line of march yet they would be able to shake their troops out and reinforce the advanced and isolated Union Corps, if they could just hold the line. A photo report of the game can be found on my Volley & Bayonet blog here. Another great game and an excellent Friday evening. There are several rule sets that are staples for me and one of these is Volley & Bayonet. I have been using these rules for something like 22 years now, yet they never disappoint. 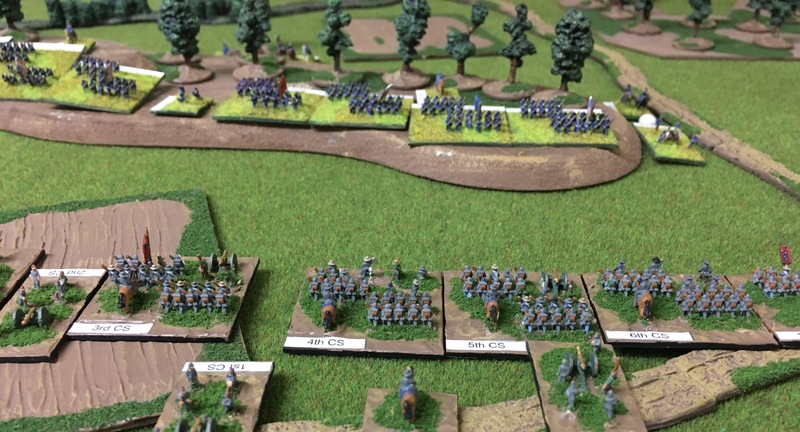 The rules capture the swirling battles of the Black Powder era and produce a narrative not unlike the historic battles of the period they represent. The rules are ideal for refights of historical battles, of which I have organised many. However, they also work well in fictional situations. Last night’s game was no exception where with little preparation our group deployed two American Civil War armies on the table. The result was a challenging, realistic and entertaining game. Several chilling events echoed historical precedent in our battle when two Confederate Corps clashed with three Union Corps. A series of critical attacks occurred around the “Angle”. Nearby brigades advanced through dense fields of corn, which me reminded me for a moment, of Antietam. All vivid memories of my visit to several Civil War battlefields last year. A brief summary of the game can be found here.